This park, located in the Montes de Toledo, is intrinsically linked to the history of Toledo, to which it belonged from the thirteenth to the nineteenth century. In 1988, Cabañeros was declared a Natural Park, becoming a National Park in 1995, with an area of over 40,000 hectars. The mountains here are heavily eroded and have a wavy appearance. Altitudes range from 620 metres to 1,500 metres on the Rocigalgo summits. The Park occupies part of the provinces of Ciudad Real and Toledo, and is a Special Reserve for Birds (ZEPA) and Site of Special Importance (LIC). Cabañeros has catalogued 1,000 species of vascular plants. Gall oaks, maples, Holm oaks and cork oaks along with aromatic Mediterranean shrub make up this most genuine of Iberian landscapes. Lakes and ponds are covered with buttercups, while yellow water lilies are common in sections of calm, deep waters of the river Bullaque. The riverbanks in these areas are dense with overhanging vegetation, formed mainly of willow, alder and ash. Among the species listed on the Endangered Species List in this region that can be found in the Park include yew, el loro, satirión de tres bulbos and white rushes. About 200 species of birds live here, among them large birds of prey such as the black vulture, the Spanish Imperial eagle and the golden eagle. The rañas (undulating plains between the mountains) are home to birds like the great bustard, the little bustard and the lark. 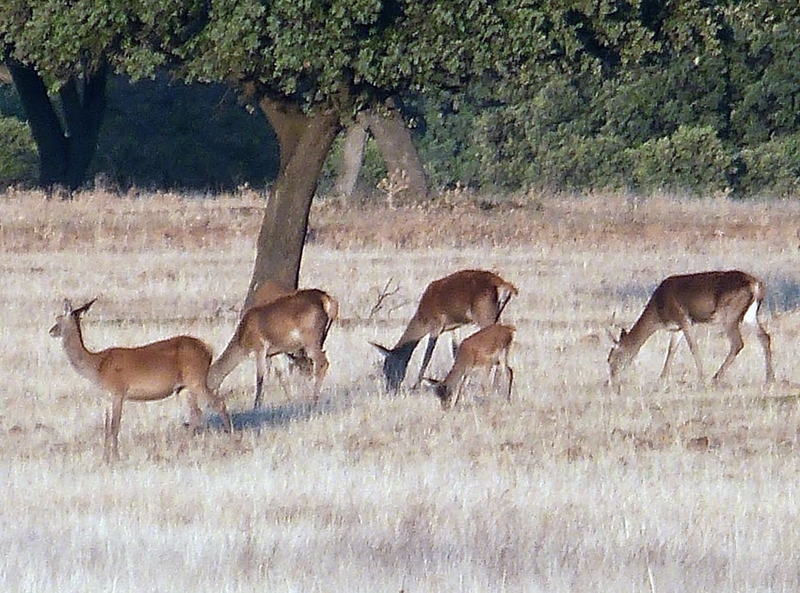 Large mammals like deer, roedeer and wild boar can be seen in Cabañeros too. Man has been present in the park for a very long time, there are remains of early settlers dating back to the Lower Paleolithic. Small Bronze Age villages have also been found. Indeed, the place takes its name from the shepherds’ and charcoal workers’ huts in the park itself. Malamoneda de Hontanar has an archaeological site of the same name, as well as a castle and tower. In Retuerta del Bullaque, Zoorama is a showcase for the animal species that inhabit the park as well as its people and traditions. In some parts in the interior of Cabañeros cork is still stripped from the oaks and beekeeping is practised. To discover the Cabañeros National Park there are plenty of trails and tracks to follow with or without a guide. They can be done on foot, by bike or in a 4×4 vehicle or quad. Activities are on offer too for organized groups and families, and include bird watching trails, horseback riding, kayaking down rivers or various workshops. 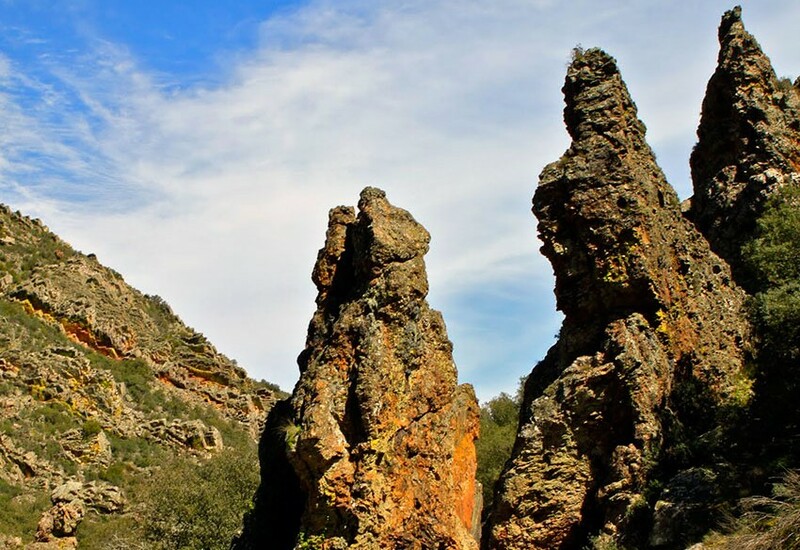 In the National Park there are the towns of Alcoba de los Montes, Horcajo de los Montes, Navas de Estena and Retuerta del Bullaque of the province of Ciudad Real; and Hontanar and Los Navalucillos in the province of Toledo. There is a visitor centre in Alcoba de los Montes, Ethnographic Museum and Information in Alcoba and Horcajo and information points in Navas de Estena and Los Navalucillos. Sources: Information provided by ACER. Associació per a la Conservació de l’Entorn i la Recerca; and extracted from www.alcobadelosmontes.es, www.turismocastillalamancha.es, www.navasdeestena.org, www.retuertadelbullaque.com, www.los-navalucillos.com, www.visitacabaneros.es, www.diputoledo.es, www.magrama.gob.es and Wikipedia.